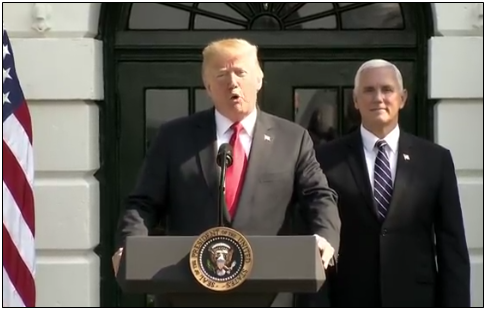 After a rip-roaring 4.1 percent inflation-adjusted economic growth for the second quarter of 2018, the economy under President Donald Trump is making tremendous progress to full recovery, after more than a decade of stagnant growth. The U.S. economy has not grown above 4 percent since 2000, and not above 3 percent since 2005. Surely, 2018 might be the year we break that trend, right? It can be. Turns out, however, to get to 3 percent for 2018 will require a bit more juice than this author had previously calculated, even with the first quarter being upgraded to 2.2 percent. Because, you learn something new every day. On Friday, after my numbers did not add up, I spoke with Lisa Mataloni at the Bureau of Economic Analysis, who — very nicely, I might add — set me straight and rescued me from my errant calculations. The quarterly real GDP rate published is the compound growth rate annualized, whereas the annual growth is just the simple growth rate of the average real GDP. The two numbers, quarterly GDP and annual GDP, are practically apples and oranges, despite being published by the same agency and utilizing the same base numbers. This was a revelation for me. I took pains every quarter to figure out what numbers the U.S. economy would have to hit for the remainder of the year to get to, say, 3 percent annual growth, yet I had still been doing it wrong after all these years. To be fair, this is not commonly understood, but this was an embarrassing outcome, to say the least. Apologies! After the first quarter came in at 2.2 percent in the advance estimate, I had originally calculated that to get back on track for 3 percent for the year, assuming the third and fourth quarters came in at exactly 3 percent, that we needed 4.1 percent growth in the second quarter annualized. But that was wrong. Turns out, the magic number for the second quarter to get back on track to 3 percent for the year — taking into account other revisions that occurred to the data since then — would have been a published growth rate of more like 4.85 percent. 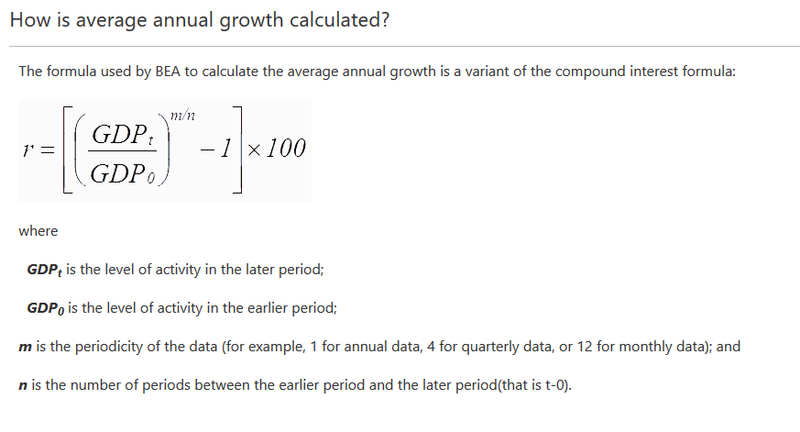 I was using simple growth rates. To get what I wanted, I then needed to translate them by running the numbers through the Bureau’s compound growth formula as an additional step. The good news is that you, my dear readers, will now know by how much the economy needs to grow roughly for the economy to get back its prior growth trends. From 1930 to 2007, the economy averaged almost 3.45 percent growth a year. But from 2008 to 2017, it has only averaged 1.46 percent growth a year. Now, with the first and second quarters in the bank, assuming the current numbers hold, to stay on track to get to 3 percent for the year will still require either a little more than a published 4.2 percent growth in the third quarter and 3.03 percent in the fourth quarter, or slightly more than 3.81 percent growth the last two quarters. Rest assured, that is now taking into account the Bureau’s compound growth formula to calculate the quarterly rate. Thank you, Lisa! Overall, this is wonderful news for the American people. And it translates into real impact for jobs and labor participation. Since the President took office, the number of working age adults aged 16-64 not in the labor force has dropped by 2.5 million even as that population increased by more than 938,000. The Trump economy is making huge progress, but we still have more work to do to get back to 3 percent growth for the year. As usual, stay tuned.